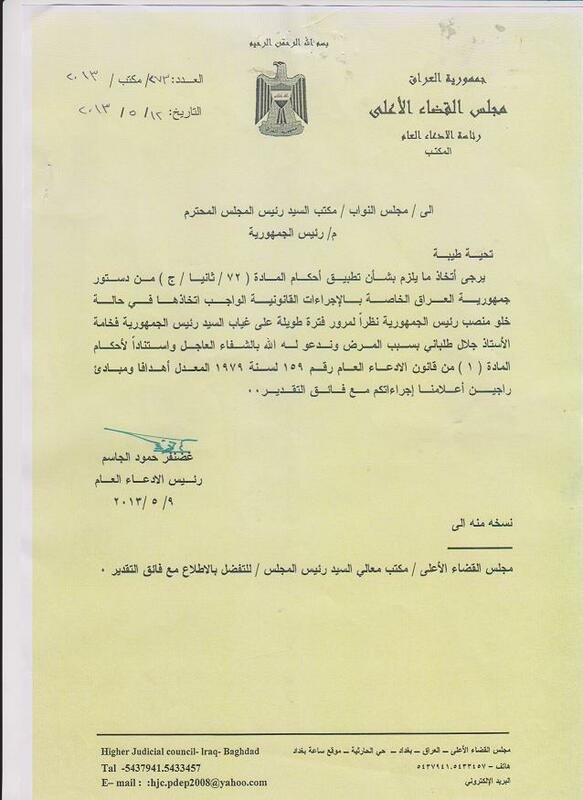 Much more will likely be written about this in coming days and weeks, but it is already now worth taking note of a letter sent from the Iraqi prosecutor general to the presidency of the Iraqi parliament, asking them to replace Iraq’s current president Jalal Talabani due to his prolonged absence for health reasons. The letter was first reported by media leaks, but it is now published on the website of the Iraqi judiciary, meaning it is definitely official and enjoys the support of the judiciary as an institution. The question of when, during a period of prolonged absence, the Iraqi president needs to be replaced is not well defined by the Iraqi constitution. Nor is there bylaws for the presidency that govern this question. The major issue concerns interpretation of article 72, which says a new president must be elected if the incumbent president “vacates” his post for any reason. The question then is, who should decide that the president’s absence is so prolonged that it satisfies the criteria for replacement as per article 72? The Iraqi judiciary today gives us the answer by referring to article 1 of the law of the state prosecution service, dating from the Baath era. That law, slightly amended in 2006, gives the prosecution service the job of defending the order of the state, and it is presumably in such a capacity it now deems itself capable of intervening. This latest step by the Iraqi judiciary raises the question of whether replacing Talabani may finally have received the support of Prime Minister Nuri al-Maliki, who has seen Talabani as a friend among the Kurds, and whose own political ally Khudayr al-Khuzaie has effectively controlled the presidency in the absence of Talabani and with the other vice-presidents either resigned (Abd al-Mahdi) or in exile (Hashemi). Barham Saleh, also from Talabani’s PUK, is reported as a possible replacement candidate. The Iraqi parliament will vote on a replacement; the aim is a two-thirds majority but if no one reaches that level, a simple-majority run-off vote will be held. Whereas the IHEC press conference announcing the results of Iraq’s 20 April local elections was merely a readout of the names of the winning candidates and their political affiliations, a second batch of useful information, giving the numbers achieved by each candidate, has now been published. This material makes it possible to analyse how the Iraqi electorate uses the “personal vote” option, whereby voters alongside their vote for a particular political entity can indicate their candidate of choice on that slate. When the votes are counted, the pre-set ranking of the candidates done by the party leadership is ignored altogether, and only specific personal votes garnered in the election count as the ordering of candidates on a particular list is done all over again. Before discussing patterns of electoral behavior, some basic information about how the ballots are cast in an Iraqi election can be useful.Technically speaking, Iraqi voters do not actually receive ballot papers that include the names of the candidates, only the entity names and numbers. Accordingly, in order to make use of the personal vote option, they need to know the number of their preferred candidate and then fill in that candidate’s number after they have checked the box for their party vote. In theory this can happen in two ways: Either by knowing the candidate’s number beforehand (and remembering it at the voting booth), or by checking a register of all candidates available at the polling station. In practice, most personal votes are probably the result of beforehand knowledge. Electoral propaganda for individual candidates almost invariably includes the key two numbers that voters require, i.e. party list number and candidate number. Several points are worthy of note here. Firstly, many of these seat winners, especially those with the highest votes, are governors. Presumably, the number one candidates on the various lists have an advantage in terms of the ability of voters to remember who they want to vote for (note though that the Diyala governor humbly put himself at the bottom of his list, only to be promoted to the top with a safe margin by his grateful electorate). But a closer look at the new councils indicate that the personal vote has done more than just provide a bit of symbolic backing for top candidates whose seats were never under threat anyway. Crucially, a very large proportion of the new Iraqi provincial councilors have been promoted through the personal vote results, rising from positions on their party lists where they would not have received seats according to the preset formula decided by party leaderships. The best measure for seeing the effect of the popular vote is to carefully study that second set of tables issued by IHEC, which ranks candidates strictly after their personal votes. Note how almost all the major lists have very high percentages of candidates that moved forward to high positions due to personal votes they accumulated, mostly with more than 50% of the candidates rising to the top of the lists of vote getters being promoted from positions further down on the list (the main exception being the Sadrist, with somewhat lower rates). This is not the whole story, though. Because of the women’s quota, the eventual seat winners are not strictly the candidates that won the most votes. Given the requirement that every fourth seat goes to a woman – and that women with a few notable exceptions garnered relatively few personal votes – the women’s quota in Iraq effectively continues to serve as a check on the electorate’s will (and as such often tallies with the interests of party leaderships, the obvious advantages of having higher female representation notwithstanding). The following table shows the number of top-candidate councilors who remained in seat-winning positions also after the personal vote had been counted (first number); councilors that were promoted from non-winning positions due to the popular vote (second number); and finally women promoted through quota arrangements (third number). It should be added that there are probably no more than a couple of women in the second group of candidates that were promoted because they outnumbered other candidates (including men) in the personal vote, the best example probably being Aisha al-Masari of the Nujayfi list in Baghdad, who got 11,400 votes and thus almost made it to the national top 15. In sum, the personal vote option, favoured by the Shiite clergy when it was introduced in 2008, remains largely successful in shaking up Iraqi politics. To some extent, the system was ridiculed when the Sadrists used it to the maximum in the parliamentary elections of 2010 by carefully orchestrating large number of personal votes for several Sadrists candidates who could then advance internally within the Iraqi National Alliance at the expense of other entities who saw their personal votes wasted on top candidates or not used at all. Nonetheless, these latest results show that the personal vote is here to stay in Iraq, and that elite politicians who choose to ignore it may be doing so at their own peril. In previous elections in Iraq, the party shares of electoral lists running as coalitions have been important especially at the parliamentary level. In 2005, the internal structure of the all-Shiite United Iraqi Alliance was important and influenced questions like federalism and the relationship with Iran, whereas in the parliamentary elections of 2010, all three main coalitions – Iraqiyya, State of Law and the Iraqi National Alliance – featured internal dynamics that would become deeply significant after the elections. At the provincial level, such intra-list dynamics have been less prominent until now, primarily because there was in 2005 and 2009 a tendency of political parties to contest the local elections as independent entities, or with only minimal coalitions involving a few other parties with which there were already existing ties – SCIRI’s “Islamic Basra” list in 2005 being an example of this. But in this year’s elections, coalitions were indeed significant, above all with respect to the State of Law list headed by Prime Minister Nuri al-Maliki. The reason is that shortly before the elections, Maliki radically expanded his list beyond what had been its core in the previous parliamentary election, i.e. the two main Daawa branches and the Independents movement of Hussein al-Shahristani, the deputy premier. Beyond adding the Jaafari breakaway faction of the Daawa (which had run with INA in parliamentary elections in 2010) Maliki’s new coalition lists now also include entities that historically have been more distant from the Daawa, especially the Badr group that recently split from ISCI after having served as its military wing in the past, as well as the Fadila party, another Islamist parties which emerged from the Sadrist movement after 2003. Today the question is how this enlarged coalitions looks after Iraqi voters have had their say by picking their favourites from the coalition lists by way of the personal vote option. One recurrent problem in these analyses is the scarcity of sources that comprehensively document sub-entity affiliations. As of today, only one governorate with a full list of the sub-entities of all State of Law candidates is known (Basra). However, alternate sources help provide a fuller picture. In particular, it seems important that most of the factions that joined State of Law more recently have some sources related to their candidates within the new coalitions. This includes Badr (whose newspaper featured extensive interviews with candidates, in addition to a Facebook page) as well as the Jaafari branch of the Daawa movement that was with INA in 2009 (the Beladi TV station has given extensive coverage to individual candidates). Additionally, the Shahristani branch has published a YouTube video of all its candidates, whereas for the Fadila party it is possible to identify most of the candidates by doing advanced searches on the party’s website of party-related news items. The problem that remains is to account for the relationship between the Maliki branch of the Daawa, the Tanzim al-Iraq branch as well as truly independent candidates. For this purpose, only incomplete sources exist, and in many places it is impossible to typologise further. However, to some extent, the analytical purpose has been achieved when the other sub-entities have been largely identified. Historically, the Tanzim al-Iraq branch has been quite loyal to Maliki, running with him in local elections in January 2009 and staying with him even in August 2009 when parts of it broke off to join INA as the Tanzim al-Dakhil branch. For their part, truly independent candidates within the State of Law alliance will often be there as a result of personal ties to Maliki. Accordingly, while the following picture may be incomplete (and relies to a large extent on a general heading of candidates that are Daawa, Daawa (Tanzim al-Iraq), or independents without further specification being possible), it does seem to summarise the main zones of insecurity for Maliki as they relate to his own coalitions in the Iraqi provinces. In recent days, there have been some rumours that Maliki had supposedly lost out to Badr, Fadila and Jaafari in the internal struggle over coalition seats resulting from the electorate’s use of the personal vote. There is zero empirical evidence to suggest that such a trend does indeed exist. 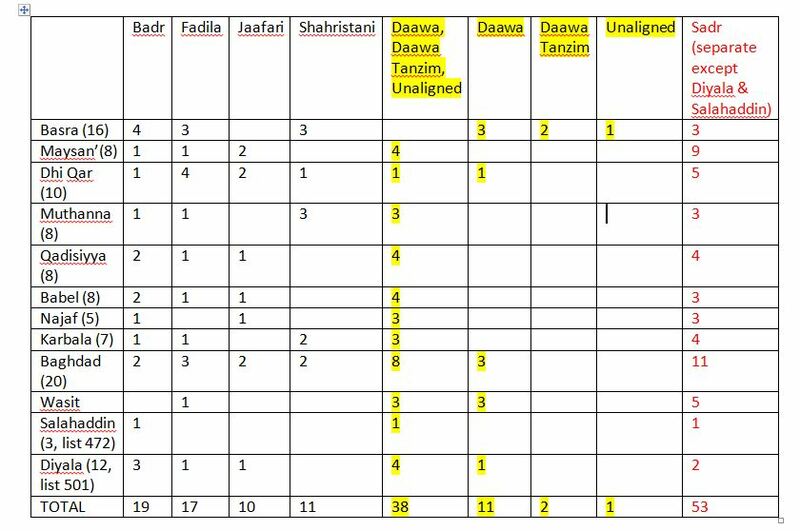 Even if we allow for the possibility that a small number of Badr or Fadila winners may have been missed due to the methodological issues mentioned, the material above confirms the picture of the Daawa branches as the pre-eminent force within the State of Law coalition, probably representing more than half of the newly elected State of Law councilors. Following Maliki, Badr and Fadila are the most consistent vote getters, with some notable results for prominent candidates, and Fadila picking up no less than 4 seats in Dhi Qar, a traditional party bastion. To the extent that internal problems in circles close to Maliki come into play, it seems more relevant to focus on several political figures with some ties to Maliki and/or the Daawa movement who quite successfully ran independently in ways that could be seen as a challenge to the State of Law alliance. This includes Ali al-Dabbagh (508), Shirwan al-Waeli (516) and Muhammad al-Nasiri (404) which won seats in Dhi Qar and Muthanna. Unlike the situation with respect to the Sadrists – where the existence of 3 additional lists beyond the mainline Ahrar list was officially recognized – it is not known to have been a deliberate Maliki strategy to cultivate these lists as supplements to the State of Law alliance. Even more important than the challengers to Maliki within State of Law are probably the Shiite lists that ran separately everywhere except in the Shiite-minority areas in northern Iraq – the Sadrists and ISCI. Since the Sadrists share seats with Maliki as part of lists 472 and 501, they have been added for purposes of comparison in the table above. With more than 50 seats in total, they form a substantial challenge to Maliki at the local level, as does the revitalized ISCI, which is still more of a coalition than the Sadrists, but which has almost 60 seats in the new councils. The process of forming provincial councils is already well under way. 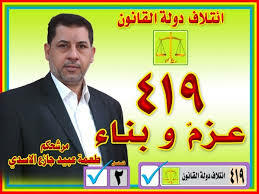 In areas like Basra, it looks like the Sadrists and ISCI are toying with the idea of trying to challenge Maliki. And the loyalties of the candidates are truly in flux as well. In Basra there are reports of a defection from the Maliki bloc, whereas the winning Iraqiyya candidate thanked his voters by joining Maliki even before the results haad been formally announced. Beyond party preferences, something in this material that anyone who cares for Iraqi democracy can be pleased about is the fact that the Iraqi electorate keeps using the personal vote option actively. Popular candidates continue to get promoted from places far down on the list, sometimes making the climb to the top from initial positions lower than 50. Party leaderships may experience this kind of voter behavior as an affront, but it is an aspect of the Iraqi political system that clearly brings greater dynamism and unpredictability to the contest, hopefully reminding Iraqi politicians that they cannot afford to ignore their voters as the next major electoral event – elections for the next parliament in 2014 – get closer. The Iraqi elections commission IHEC today released the final results of the provincial elections on 20 April. The seat distribution, presented below with figures from 2009 in parentheses, largely confirms the picture that emerged from initial results. Among the Shiite Islamist parties, Prime Minister Nuri al-Maliki has lost some seats in some governorates but is still the biggest seat winner, with particularly strong positions in the governorate councils of Baghdad and Basra. Despite internal splits, ISCI has done a moderate comeback in several governorates. 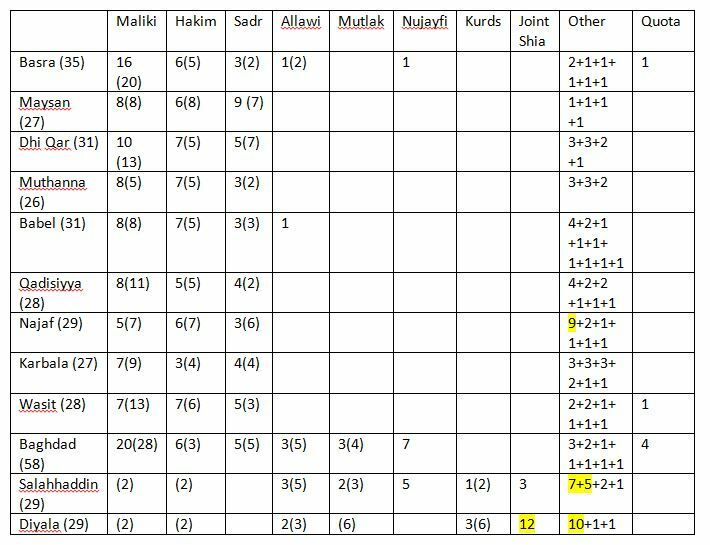 The Sadrists won back Maysan but otherwise are not making big advances; in Najaf, a local list is the biggest winner, exactly as in 2009. It is noteworthy that the Shiite parties that ran together in Diyala managed to emerge as the biggest winner with 12 seats; this will certainly be seen by some as an indication of increased sectarian polarization. With respect to parties associated with Sunni-majority areas, it is noteworthy that the Mutahiddun list headed by the Nujayfi brothers has emerged as the most formidable force nationwide, with more votes than competitors like Salah al-Mutlak and including a very respectable result in Baghdad. In Salahaddin, a local Sunni list emerged as the biggest winner, whereas in Diyala forces associated with Nujayfi and Mutlak joined together, though without beating the pan-Shiite list. The traditional secular parties have fared poorly. Especially noteworthy is the decline of the Iraqiyya list of Ayyad Allawi, which has now only 2 seats south of Baghdad (Basra and Babel), and which was eclipsed by parties with more pronounced Sunni profiles north of Basra. Similarly, none of the breakaway parties from the Iraqiyya coalition such as Free Iraqiyya or White has achieved particularly good results. Similar to the various alliances associated with the Iraqi communist movement, these parties are reduced to isolated seats in a small number of governorates. It seems worth mentioning that the Kurds lost a few seats in the two governorates where they competed (Salahaddin and Diyala). The process of forming coalitions and new local governments now begins. In 2009, this lasted 3 months in total. However, in some governorates negotiations are already underway, with parties in Basra even holding press conferences for the announcement of coalitions and job distributions before the official result was ready! In Shiite-majority provinces, a key question is whether Maliki will this time turn to ISCI rather than to Sadrists as his main partner; in Diyala, there is the possibility that the pan-Shiite list may try to circumvent the biggest Sunni parties to build alliances with the Kurds and smaller Sunni parties. Whichever strategies are chosen, the effects on Iraqi political dynamics are likely to be huge – at the heated national scene as well as in places where the local elections were postponed (Anbar and Nineveh).